The women of BYU CHI redefined success and made the 2018 season their best in program history. BYU CHI cheers together. Photo courtesy of Quincey McKeen. The Northwest region earned an “Evil Empire” moniker with years of dominance in the Women’s D-I college division. In 2014, powerhouse programs from the region dominated the regular season and sent a record six teams to the College Championships. The next two years, the Northwest secured “only” five bids—still more than some regions see over the course of a traditional college career. After last year’s two-bid blip, four bids will be in play yet again this weekend at the D-I Women’s Northwest Regionals. But this year is slightly different. One of the season’s strongest Northwest contenders, finishing just outside of bid contention, won’t be lacing their cleats in Walla Walla, WA. They’re still in Utah, and their season is over. For the first time in program history, the BYU CHI women’s team ended their season in the USAU Top 20 rankings. And like their male counterparts, they were good enough this season to potentially claim one of their region’s bids to Nationals. But in an echo of the men’s experience, they won’t even have the chance because their school forbids Sunday play, eliminating any ability to advance beyond Conferences. This isn’t a story about how BYU can’t play on Sunday—that’s not news for the BYU women. Unless USA Ultimate changes their rules—which seems very unlikely—they will always drop out of tournament contention after Saturdays. This is the story of how and why these women decide to compete anyway. This is the story of how and why they got really good anyway. When current BYU captain Quincey McKeen began playing with CHI in 2011, she joined a small, ragtag squad of maybe a dozen women. Then, like many players at BYU, she left for her mission, a common rite of passage for members of the Church of the Latter Day Saints. When McKeen returned in 2014, the BYU women’s team expected to field only about five players for the upcoming college season, with half of the women graduating from the core group McKeen had met in her first year. Former BYU coach Ryan McCready recalls thinking his main goal for the season would be simply recruiting and retaining enough players to field a team. Luckily, low numbers was not BYU’s fate. A young class of athletic recruits signed up for the team in 2014, a group who helped shape BYU’s future in the division, including current seniors Kaylie Caldwell and Ciera Orr. Many of these women came from other sports before ultimate. Caldwell had played rugby and racquetball already in college; Kendra Mitchell ran track. They were ready to run, work hard, and learn to throw the disc. 2014 was also the first year that McCready stepped up to coach the team. He was a BYU alumnus and was part of the local ultimate community when the coaching opportunity came up. McCready remembers that first year well. The BYU men’s team was already on the rise in 2014—that year they went 19-1. By 2016, they would earn a strength bid for the Northwest region. The BYU women’s team gradually developed their own play style. They were athletic early on and their sheer speed, coupled with one or two women who could huck deep, earned them easy points. They ended the 2015 season with a 3-1 record.1 The following year, they improved to 8-1 after attending two tournaments against less competitive West Coast teams. With each successive year, BYU honed their skills and built a team culture, yet they still lost players. Most teams experience attrition, but it looks different for BYU. Some women stop playing because they lose interest, but others get married and their priorities change. Some women choose to have children and they have to take time off. The BYU women’s team doesn’t lose players to semesters studying abroad. They lose them to eighteen month missions. These missions are a fact of life for BYU students, but that doesn’t make the reality any easier when they’re trying to build a competitive program. “We have a lot of freshmen who come in, they’ll go to school their freshman year, and then once they turn 19 they’ll leave,” said McKeen. Mormons have a certain amount of time to exercise daily while on their missions, but even when they convince their partners to throw, the experience isn’t the same as training in-season. McKeen and the rest of the BYU captains emphasize that their experience doesn’t feel that different than other college students or ultimate players. And she’s right; the narrative of young teams struggling with recruitment or teaching skills is not unique in ultimate, particularly for women’s college teams that are historically (and unfortunately) newer than the college’s men’s teams. Despite long absences and attrition, BYU continued to improve. In 2017, they committed to traveling to Santa Barbara Invite and Stanford Open for the first time. They went 1-3 at SBI but they were undefeated at the Stanford Open on Saturday. They were undefeated at Boise Big Sky Brawl and they headed into their first Northwest Challenge feeling confident and ready. The weekend did not go as planned. More than a year later, the BYU captains and their former coach talk about the 2017 Northwest Challenge as the kind of wake up call that rouses you up, douses you in cold water, then shakes you furiously. BYU lost every game they played. They came out hot against Oregon—losing the game by only three points—but then they lost the rest of their games by six or more. “That was probably the most draining tournament I’ve ever experienced, as a player or as a coach,” said McCready. The team put all their energy into their first game, so they were gassed when they faced the skilled efficiency of UBC’s offense. For this scrappy, athletic, and still nascent program, the gap in their skillsets was formidable. In last year’s rain, wind, and mud, BYU lost to Whitman and Notre Dame to round out their weekend. The game against Oregon showed BYU how well they could play against elite competition. Their losses for the rest of the weekend showed them just how far they had to go. They tasted what the next level could be, and they decided they could work their way there. Even if they could never reach the sport’s highest level of competition, they could still change the story of their next Northwest Challenge. The team began weight training instead of relying on only track workouts. Some players, like Caldwell, Mitchell, and Orr, joined the local club team, Utah Elevate, over the summer. 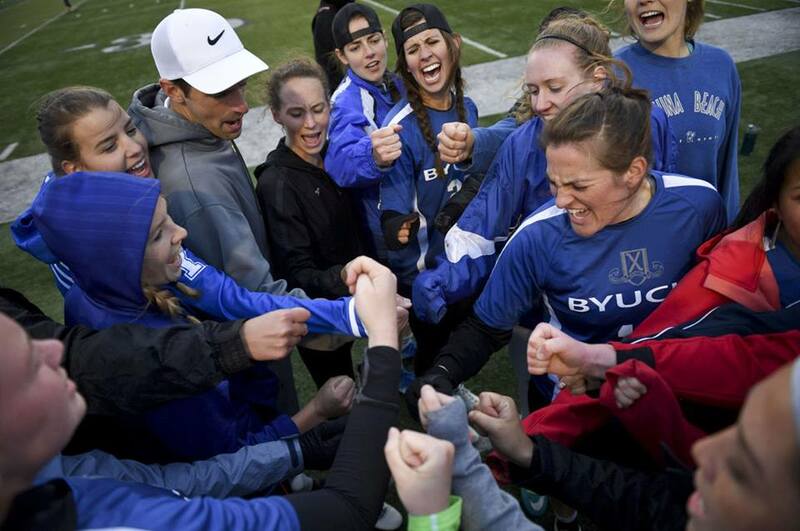 Last fall, instead of feeling grateful if women showed up to play, BYU held tryouts. The BYU women had one goal in mind: to break into Ultiworld’s Top 25 Power Rankings. They had never made the list before, but the goal felt right: they had a strong senior class, athletic rookies, and the drive to put in the work. For the first time, the team had a shared motto and a common goal they could work towards together. The results showed: they gave Stanford one of their toughest games of Santa Barbara Invite and they were one point away from upsetting Colorado State in pool play. But the season wasn’t going to be that easy. Midway through, BYU and their longtime coach McCready agreed it was best that he step back from coaching. McCready had begun an intensive nursing program in addition to his fulltime job and coaching, and the women realized they needed more facetime with a coach to reach their goals. McCready stepped back and another BYU alumnus2 Jason McKeen stepped into the role. McCready had helped BYU build their program, and McKeen was the perfect coach to help them push the final mile before the 2018 Northwest Challenge. McKeen had attended practices with the BYU women’s team before the coaching transition, but once he adopted the role full-time, he asked the team if they wanted to pour gas on their training efforts for the month leading into the tournament. When they said yes, he designed a rigorous training program that included three lifting workouts, two throwing workouts, two practices, and one track workout, every week. The programming was tough—BYU’s training regimen would be challenging for most club athletes, nevermind a college squad. But the team committed to that one month, building sweat equity together and deepening their trust in one another. They built the kind of trust you only earn from showing up to those early morning track workouts, or from throwing the same backhand to your teammate one thousand times. BYU only brought 13 women to the 2018 Northwest Challenge, but it didn’t matter to them. They knew they’d done the work. They knew they were ready. CHI played their first game in Friday’s second round, just after the skies had stopped dumping snow and rain on the fields. Fired up, BYU threw their full speed and energy at a tired Western Washington team who had braved the snow in Round 1. BYU broke twice to start the game, and took half 8-3. They busted through Western’s zone time and again with big throws, and they earned their first Northwest Challenge victory with a commanding 15-9 win. Caldwell and fellow senior Jemi Ong were agile and undeniable forces behind the disc, while Mitchell and McKeen ran tirelessly downfield. BYU lost again that Friday to #3 British Columbia, but this time the loss was a close 10-8 battle instead of the beatdown they took a year earlier. Game after game at Northwest Challenge, the BYU women cheered the word that had grown to define their journey up to that weekend, a word that in so many ways defines the journey of their program: undaunted. They cheered “undaunted” to remind themselves to play like they are unafraid of programs just because they were top 20 regulars. They would either win games or give everything they had in trying to win. Such was the case when they faced Carleton College, ranked #6 in the Ultiworld Power Rankings at the time, on Saturday of the tournament. It was a game that came to define the undaunted concept more than any other for BYU this season. Carleton’s efficient cutting and skilled handlers matched well against BYU’s athleticism, and the teams traded long, grueling holds for the first half. BYU’s small roster poured all their energy into celebrating every hold and every big play, cheering “Undaunted” at each other, for each other. “There wasn’t a specific moment in the game I remember, but I was just like, this is working and we’re ahead and I don’t know how,” said Quincey McKeen. BYU broke to take half, and they held the lead through the end, winning 11-8. This win, coupled with their decisive play throughout the weekend, brought them into the Ultiworld Top 25 for the first time, at #12. Years of team development, months of hard work, and one grueling final month of training paid off. It’s easy to follow ultimate along a linear narrative: play well, earn a bid, qualify for Nationals, and play your hardest once you’re there. When that narrative gets cut short, some teams would shrug and continue playing local tournaments. Some teams would raise hell, complaining about the restrictions imposed upon them.3 Others would just switch sports, find something simpler. But when there isn’t more on the line beyond the game in front of you, the game becomes everything. All BYU has are the wins in their regular season record, while the rest of the division advances into the glory and the drama of Regionals and Nationals. For that reason, the games at a tournament like Northwest Challenge feel different for the women of BYU CHI. They cheered and played to honor that. This year’s BYU women’s team will never step onto the fields at Nationals, nor will they even play in a game to go. But they decided to try, anyway. Limited from ever reaching the pinnacle of the division, BYU designed their own version of success inside the parameters they are confined within. Their reasons are simple and act as a lesson for the rest of us ahead of the competitive end of the season: the ladies of BYU CHI worked hard because they loved and trusted each other. They kept playing because they loved the game of ultimate, undaunted by missions, marriage, or never playing a Sunday game. Comments on "BYU Is Undaunted: A Story About The Best Team That Won’t Play At Regionals"